Welcome to Everglades City, a destination gateway for outdoor enthusiasts and a close-knit community with only one school for students in kindergarten through twelfth grade. 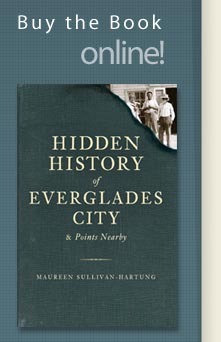 Author Maureen Sullivan-Hartung presents an eclectic history of the best parts of Collier County, from Barron Gift Collier's vision for a company town to the hurricanes and fires that forever changed the landscape of the Last Frontier. Quirky and entertaining anecdotes describe the challenging creation of the Tamiami Trail, trading with Indians on Chokoloskee Island, illegal plume hunting and, of course, marijuana smuggling. Deep in the swamps, mangroves and sawgrass, readers will also find bits of the past in the former boomtowns of Copeland, Jerome, Lee-Cypress and Ochopee. - across from the Western Hemisphere entry of the Everglades National Park.